We do. That’s why we operate our own publishing division. Redleaf Press is a leading publisher of Early Childhood Education and distributor of exceptional curriculum, management, and business resources for early childhood professionals. Redleaf Press titles represent a broad range of topics designed to provide early childhood professionals with stimulating, child-centered approaches based on sound and accepted theory. These professional development and instructional materials improve the lives of children by strengthening and supporting the teachers, trainers, and families who care for them. Redleaf Press was established in 1973 and has a national and international presence in the early childhood field. In 2013, Redleaf Press launched Redleaf Lane, an imprint featuring engaging, high-quality picture books for children. Redleaf Lane books are unique because they focus on challenges that all young children face and reflect the same developmentally appropriate practices and research-based standards that all Redleaf Press books are known for. Many of the stories take place in group-care settings .They are fun to read and beautifully illustrated—and sure to become childhood favorites. 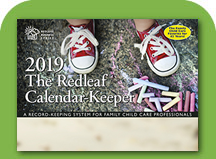 Simply put, Redleaf Press and Redleaf Lane deliver a wealth of information to all early childhood professionals—family child care providers, center teachers and directors, early childhood organizations, and post-secondary academia—and the children they care for and teach each day. When you’re thinking education, Think Small. A Record-Keeping System for Family Child Care Providers. This all-in-one calendar and expense/income tracker includes monthly attendance charts, payment logs, food program tallies, and a tax worksheet that corresponds to particular lines on key tax forms. It also includes monthly recipes and menus that each meet CACFP guidelines, learning activities, and wellness tips. Order Yours Today!